Structural and policy problems prevent the SCO from being an effective Central Asian security organization. With the administration of President Barack Obama intent on withdrawing all but 10,000 troops from the International Security Assistance Force (ISAF) in Afghanistan by the end of 2014, the region is bracing for a security vacuum that is primarily affected by a lack of cooperation and interstate awareness in the vicinity. Although the recently concluded presidential elections in Afghanistan do offer a glimmer of hope for the restoration of a legitimate, autarkic government, the possibility of a relapse far outweighs the practicality of such hope. While there is a multilateral organization in the region that could potentially manage this looming regional instability, it is not yet up to the task. Instituted by the members of the Shanghai-Five plus Uzbekistan in the months preceding September 11, the Shanghai Cooperation Organization (SCO) is more of a private club, with ambiguous organizational mandates and individual state-driven interests, rather than a competent collective body. The “Shanghai Spirit,” a guiding doctrine of the SCO, dictates sovereignty and the importance of non-interference in the state affairs of other members. For the Central Asian republics, this principle has provided a measure of immunity from Chinese or Russian forays into their territories. However, this principle has failed the SCO on a few prominent occasions in the past, which questions the capability of the forum to function efficiently as a regional power bloc. Prominently, the Shanghai-Five’s inability to lead a joint defense framework in Afghanistan in the latter part of 1990 will be the precedent by which any decisions taken in the name of regional security now will be judged. All members of the SCO were affected by the spillover of terrorism from Afghanistan. Between 1998 and 2000, the SCO members jointly expressed concern at the deteriorating conditions in Kabul. Given their own domestic problems, however, coupled with a general disinterest in directly committing coordinated forces and resources toward the Afghan issue, the SCO took a backseat as the ISAF stepped in to address the situation. When Russia invaded Georgia in 2008, the SCO members condemned the move, stating “the participants [of the SCO summit] underscore the need for respect of the historical and cultural traditions of each country and each people, for efforts aimed at the preservation, under international law, of the unity of a state and its territorial integrity.” The recent reunification of Crimea with Russia after asserting Russian interests in Ukraine is another test for the SCO’s unity, one that may decide the future of a SCO-Collective Security Treaty Organization (CSTO) joint framework. In 2010 the Kyrgyz capital of Bishkek witnessed ethnic tensions after the ouster of President Kurmanbek Bakiyev from power. The resulting Second Kyrgyz Revolution resulted in almost 400,000 displaced persons, and around 2,000 deaths. The media was rife with accounts of mass killings, gang-rapes and torture. But the SCO refused to intervene, even when one of its member states was in an acute state of civil unrest, not wishing to break its precedent of non-interference in member state’s internal affairs. While the other four member states are proceeding toward a security guarantee, Russia holds the SCO’s utility in a different light. Moscow perceives Beijing as the dominant member in the organization, and thus Russia does not command the same influence over the Central Asian republics via the SCO. It is therefore no surprise that Russia prefers to engage these republics through the CSTO for security issues, and through the Eurasian Economic Community (EURASEC) on the economic front. Beijing has its own reasons to be wary of Moscow’s participation in the SCO. China usually prefers to deal with other nations bilaterally. The SCO is the only active exception to that rule (apart from the U.N.). The SCO, to a great extent, reflects the Chinese ambition to be part of a regional security bloc akin to NATO. China also benefits enormously if it manages to sign a Free Trade Agreement (FTA) in Central Asia. The SCO is the only medium for Beijing to realize both of these objectives, since it does not participate in the EURASEC, ASEAN, SAARC (observer status only), or the CSTO. An ulterior motive for Beijing to push for better functioning of the SCO is that it brings China closer to Russia. The Russians and the Chinese have not always seen eye to eye, and the SCO offers the countries the opportunity to come together on an equitable platform to amicably solve their differences. With an active U.S. policy seen as “containing” China, Russia is a much needed ally. It is not surprising that Iran, Pakistan and India are not members of the SCO, and will not be offered membership anytime in the near future. The perpetual Indo-Pakistani conflict would only act as a catalyst for internal differences within the forum, without offering any substantial benefits. And it would be impossible to admit one without the other, given the proximity of relations between India and Russia, and China and Pakistan. As for Iran, the current sanctions imposed by the U.N. prevent Tehran from joining the SCO, as per its charter. Even if the founding members collectively rule in favor of Iran’s candidacy, the SCO would come in direct confrontation with the U.S. and its sanctions directed at Iran’s nuclear program. 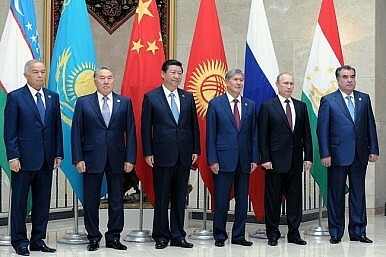 Without India, Pakistan or Iran as full members, the SCO falls significantly short of fully representing Central Asia. The Shanghai Cooperation Organization is a useful forum for discussion and cooperation. However, its inherent organizational flaws, along with the national interests of its member states, prevent it from fulfilling its potential in the region. And for this reason, the SCO is unprepared to take over from the ISAF after 2014.